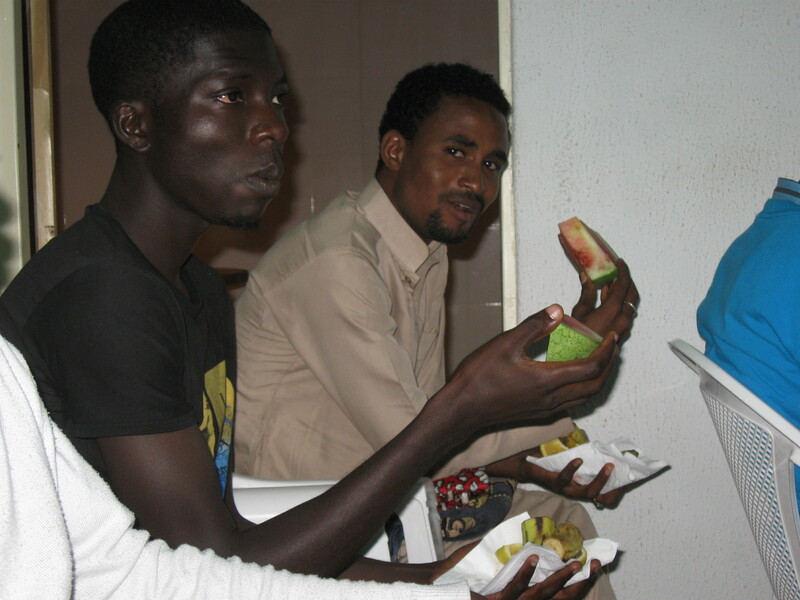 On Thursday, 2 August 2012, around 80 Muslim and Christian youth gathered at the YACPIF office to break the Ramadan fast together. 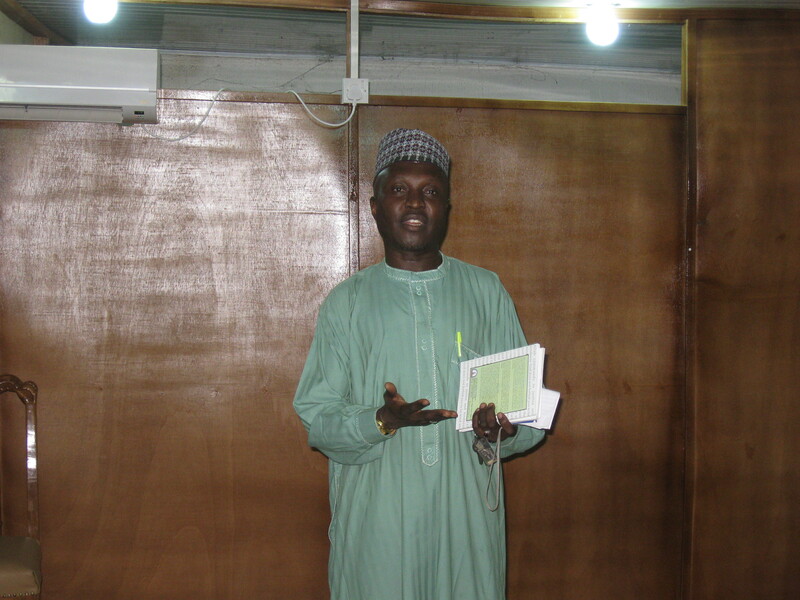 First, Mallam Farouk from Jama’atu Nasril Islam (JNI) discussed the importance of Ramadan in the Islamic faith. 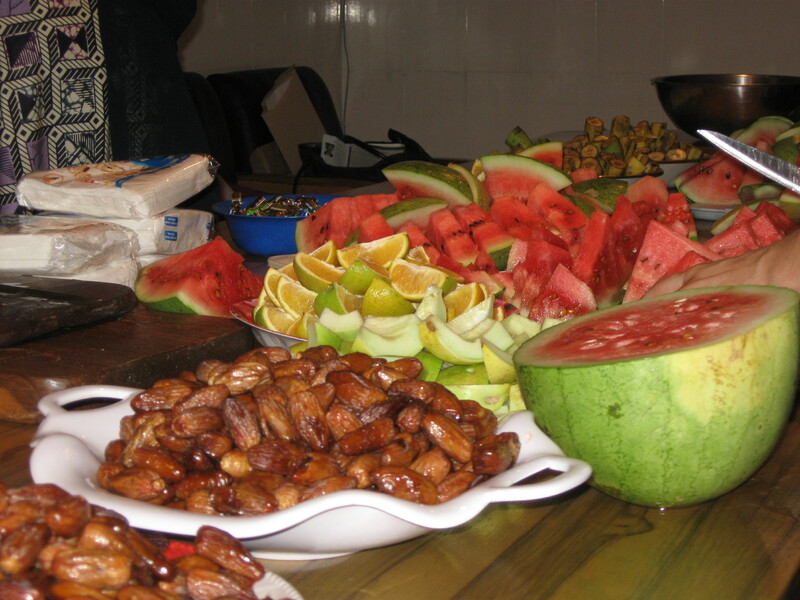 Once the sun set, the dinner began with fruit. 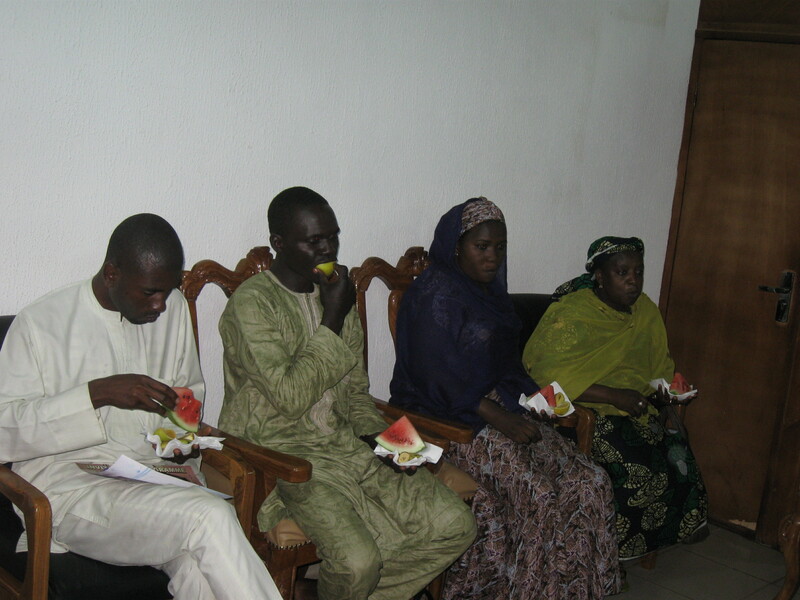 Dates and other fruit were distributed. 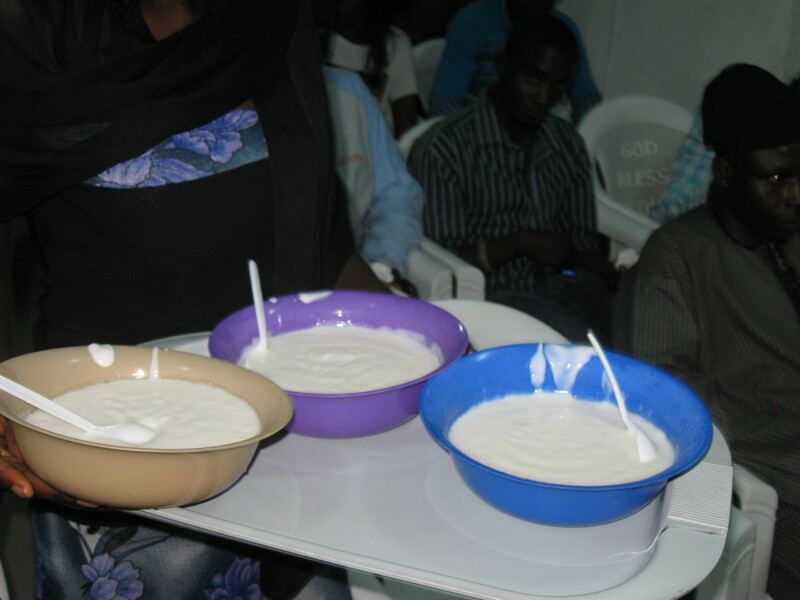 Next, kosai and kunu were served. 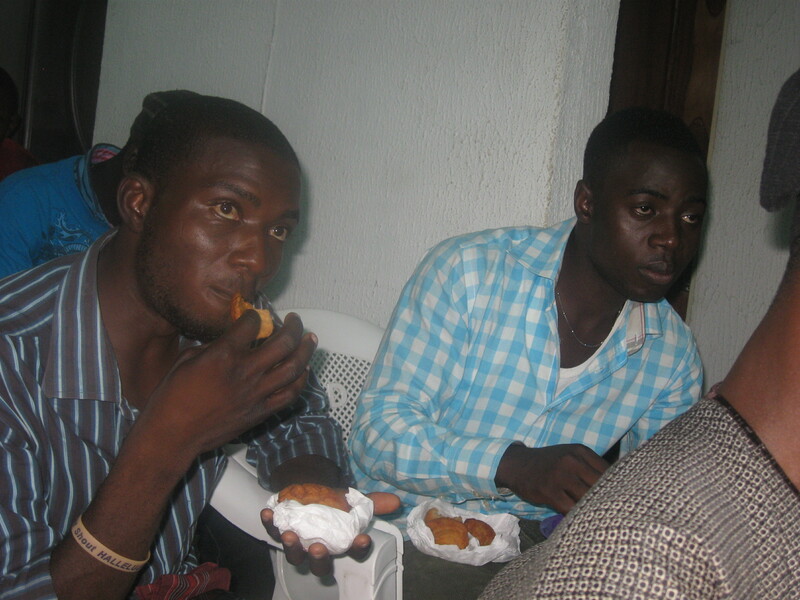 Finally, minerals were served with fish and rice. Throughout the dinner, both Muslims and Christians shared messages of peace. 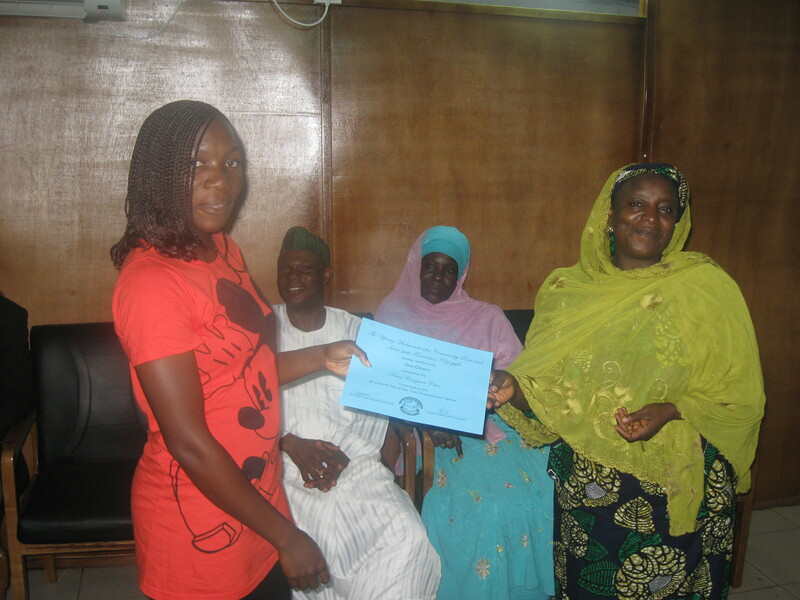 After the dinner, certificates were presented to youth who recently completed the YACPIF computer class. Finally, friends departed in good cheer. For the link to the article, click here. Last week, I reviewed Rev. Yakubu Pam and Dr. Katrina Korb’s book Fighting for Peace: Learning from the Peace Heroes Among Us, which tells stories of both Christians and Muslims who have overcome prejudices and hardships to work for peace. 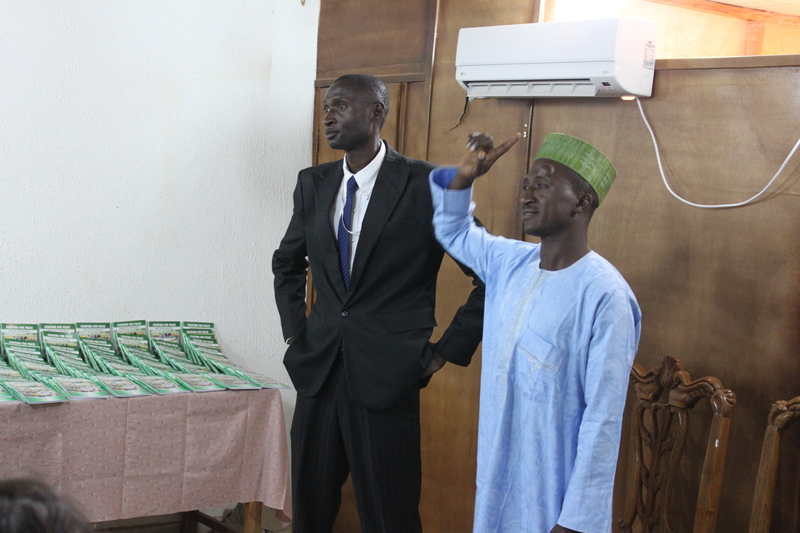 The day after I turned in my review, I attended the launching for the book held Thursday, 22 March, at the office of the Young Ambassadors for Community Peace and Interfaith Foundation (YACPIF) in Jos. Although initially envisioning a bigger affair, the authors felt it would be inappropriate to have a large launching while families were still grieving after the two church bombings in Jos and subsequent violence against members of the Muslim community. 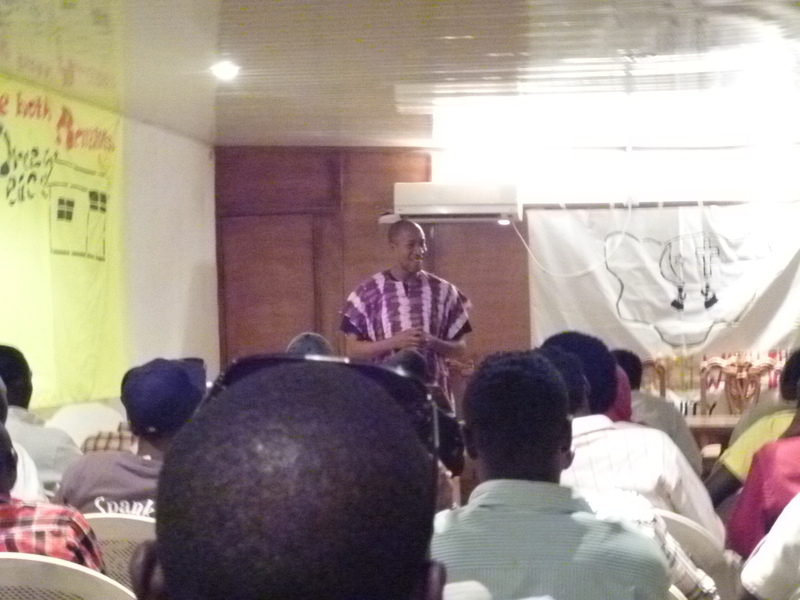 Instead they combined a youth meeting with the book launch. 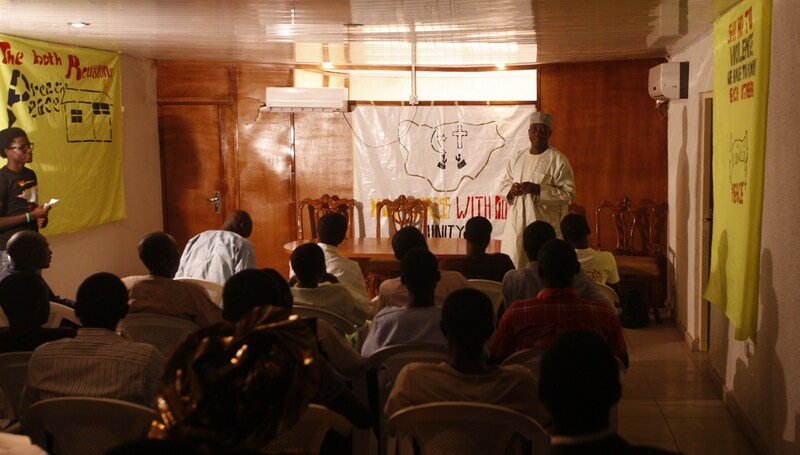 While the meeting was attended by a few people from the university and the film industry, including filmmaker Sani Mu’azu who had written the forward to the book, most of the participants were youth from the community involved with YACPIF as “young ambassadors.” It was their voices who were most heard at the event. If reading the book had sometimes brought tears to my eyes, I was even more touched by hearing Christian and Muslim young people tell in their own voices, stories of friendship and peacemaking. 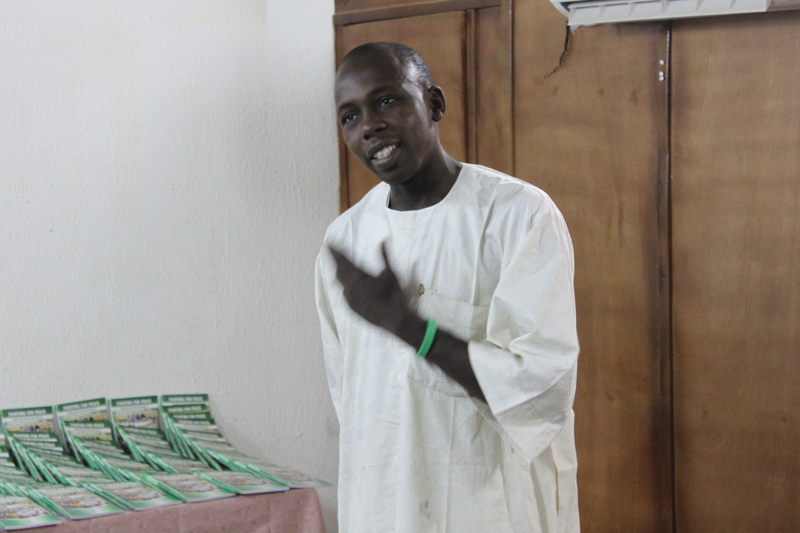 Like Augustine, a Muslim Saraut Aminu described how youth were getting themselves killed over rumour, narrating how not long ago some friends came to him and told him that three okada drivers had been killed and that he should come with them to fight. “Where were they killed?” he asked. They didn’t know any details. “Somebody told us,” they said. He pointed out that the person who saw the bodies should take one of the many soldiers stationed in the city to the spot, but if youth go out with knives and guns to avenge rumoured deaths, they will simply get themselves killed. So many of the stories we hear these days fill us with despair: bomb blasts, schools burned, innocent people dying daily. But in the midst of all the bad news, we must not overlook these stories of friendship and love, such as the stories told here or the story told by Margaret Ahmed of the Homemaker’s Women Development Initiative near the end of the launching about how, in November 2011, Muslim women in Jos donated six bags of clothes to Christian victims of the Barkin Ladi crisis. Last week, after I posted the link to my article on Facebook, one of my friends asked me what of those in Kaduna. 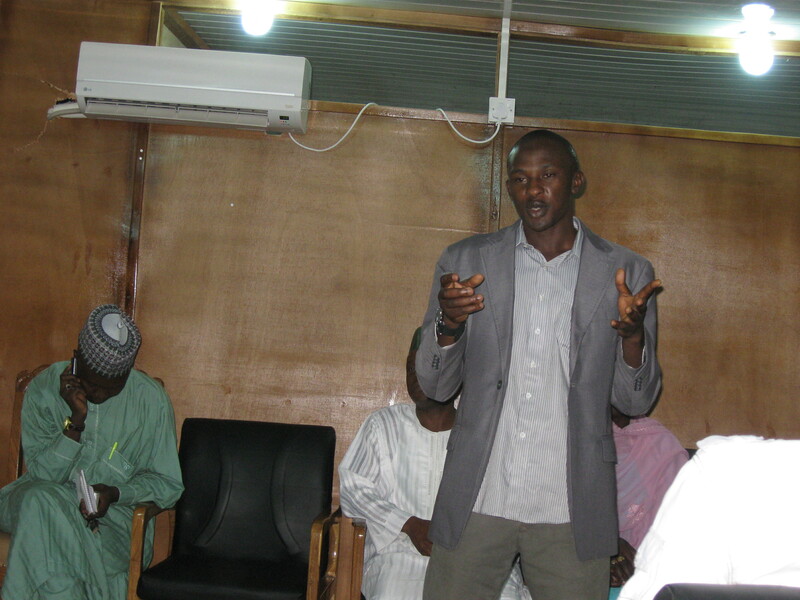 “You all in Kaduna should write a book too,” I told him. All of us need to take the responsibility to spread stories of grace rather than destructive rumours. If our minds are filled with reminders of the kindness and humanity of our neighbors, it will become much harder to fall prey to manipulation by those who would use us to help destroy our own society. This is the way we march forward, little by little. During the November 2008 crisis in Jos, an old Muslim man went to sit on the steps of the neighborhood Assemblies of God church in Kwararafa. Four times, he turned away angry youth who wanted to burn the church. The fifth time, the youth attacked him. Two weeks later he died of his wounds. Before he died, he told his wife, “You tell Pastor that he shouldn’t worry. 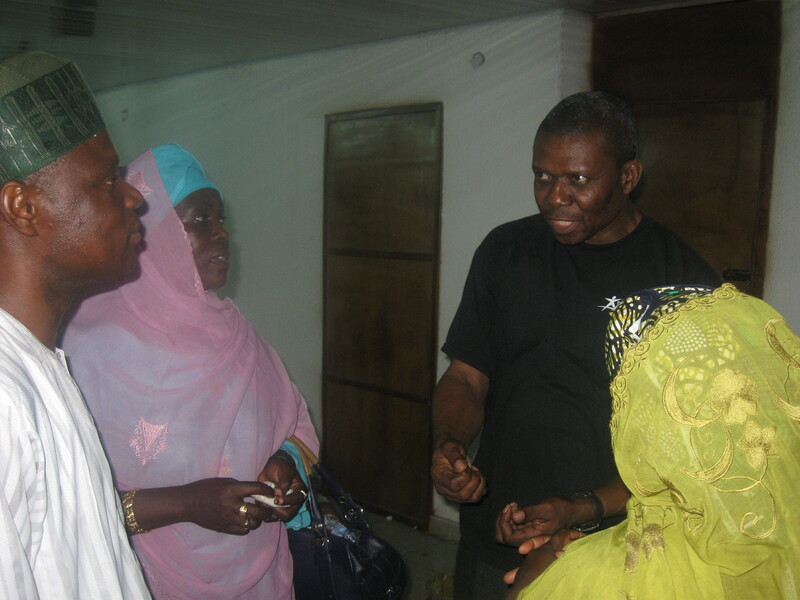 For what I have done for the church is for the sake of peace and the neighborhood and I love him very well.” Thus goes one of the first stories found in Fighting for Peace: Learning from the Peace Heroes Among Us by Reverend Yakubu Pam and Dr. Katrina A. Korb. 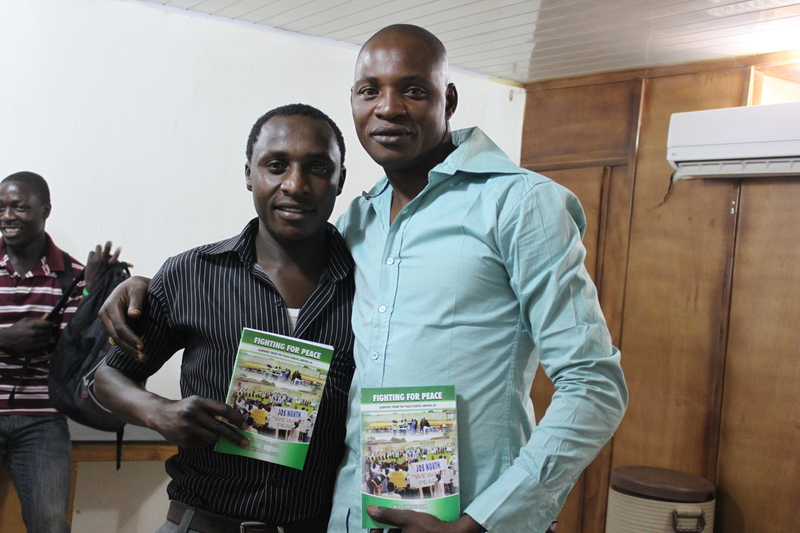 In the book, which was launched at the Young Ambassadors for Community Peace and Inter-faith Foundation (YACPIF) office in Jos on Thursday, the authors follow the thesis of Ugandan priest Emmanuel Katongole (presented briefly in a guest column by Dr. Korb in September 2011) that the stories we tell shape the people we become. 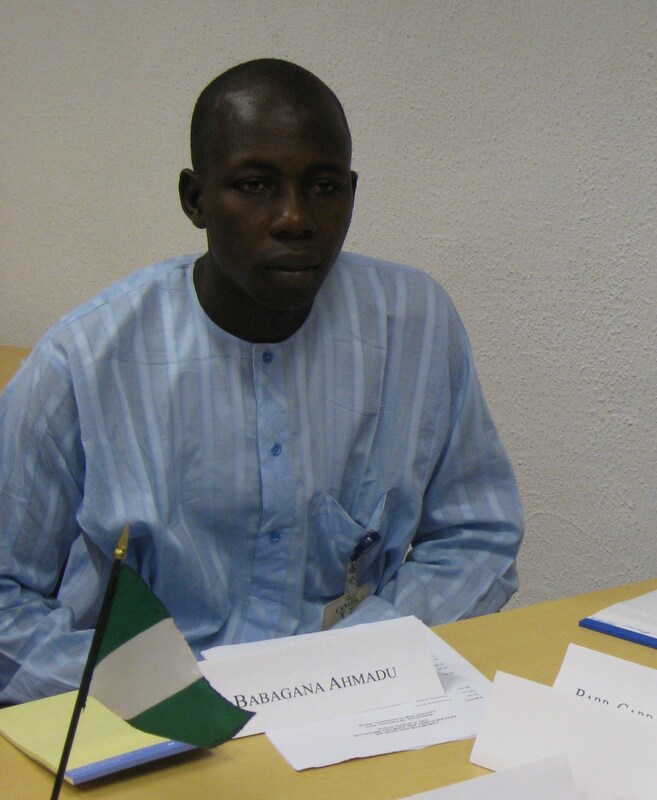 Fighting for Peace challenges negative stereotypes heard so often of Plateau State and the north, telling detailed stories of eleven heroes, both Muslims and Christians, who, in the face of violence, chose the path of peace. The book is in much the same genre as Ruth Beattie’s, My Brother’s Keeper: Stories of Grace from the Jos Plateau (ACTS: 2010) that compares the author’s experiences growing up during the political and religious conflict in Northern Ireland with her observations of the conflict in Jos. However, while My Brother’s Keeper tells stories of “good Samaritan” Christians and Muslims directed to an explicitly Christian audience, Fighting for Peace attempts to balance between Christian and Muslim perspectives, offering arguments for peace from pastors and imams, the Bible and Qur’an. These three stories were directly related to the YACPIF advocacy group, but other chapters narrate powerful stories of other Christians and Muslims who despite being personally harmed followed personal convictions to love their neighbor. 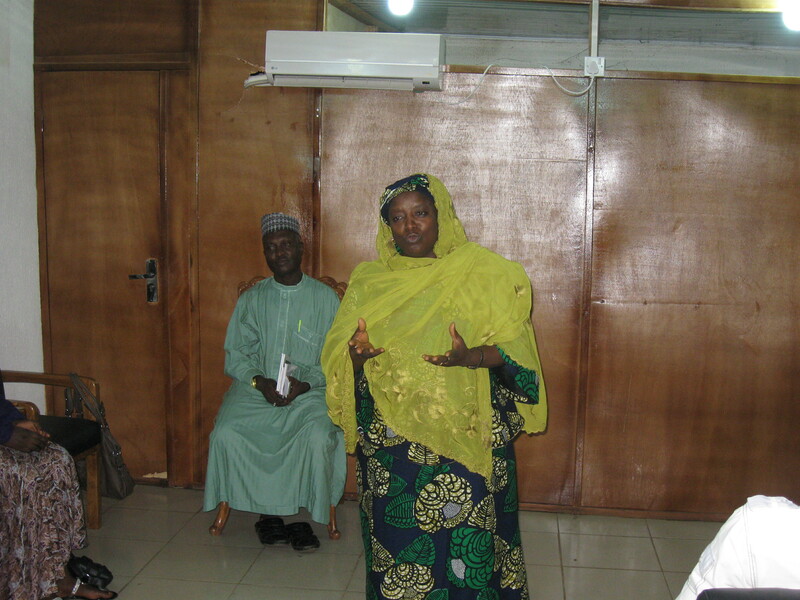 Hajiya Nafisat, for example, the national legal advisor for the Federation of Muslim Women Associations in Nigeria (FOMWAN) has been uprooted multiple times since the 2001 Jos crisis. In 2010, the house her family had spent twelve years building was burned by Christian youth. However, only three days after her house was burnt, she went, wearing donated second-hand clothes, to speak at a peace forum, telling a mixed Christian and Muslim youth audience, “I believe it was just madness, something just went off in us and then brought out the inhumanity in us. Despite that, there were good lessons: that Christians were saved by Muslims, and Muslims were saved by Christians.” Similarly the newly built home of Ustaz Farouq Muhammad, third imam of the Fiber mosque in Jos, was destroyed by a Christian mob in 2009. Later, he discovered some Christian laborers, who worked in his company, wearing his clothes. They told him that they had not realized it was his house they had destroyed, and he allowed them to keep both the clothes and their jobs. He said that he learned forgiveness from the Qur’an, saying, “He who has patience and perseverance and will forgive and forget, this is very difficult but the reward is big.” Another example of forgiveness comes from the story of Pastor Sunday, whose church building and home was burned twice by Muslims, but who continued to build relationships with his Muslim neighbors, including paying out of his own pocket for his parishioner’s windscreen that a Muslim child had broken. When he was called before the Plateau State governor in 2004 during a mixed Christian and Muslim delegation, he told the governor good stories about his Muslim neighbors including that some had been wounded while trying to protect the church. Pastor Sunday has become a strong advocate of Christian and Muslim community integration. These are just some of the stories that demonstrate that humanity and grace exist on both sides of the religious divide in Jos, and by extension much of the rest of the north. Pam and Korb point out how these examples illustrate theories of peacemaking developed by other leaders of non-violence around the world, such as Dr. Martin Luther King Jr. and Mohandas Gandhi. The book is complemented by a colour photo insert of some of the people and events described, including a few of my own photos. The main critique I have of the book is that interviewing in English seems to have limited the expression of a few people who might have been more comfortable speaking in Hausa. Translation may have made for smoother reading. However, despite a few flaws of this sort, I think the book should be required reading not only in Jos, where most of the stories occur, but also across the country. In an age where extremists seem to rule and stereotypes and myths feed mutual violence, we need to be reminded that prejudice is the greatest cause of division. The most important fight of our lives should be one in which we join hands across the divide in a nonviolent struggle for peace. The role models described here show us the way. Dedicating the book Fighting for Peace. 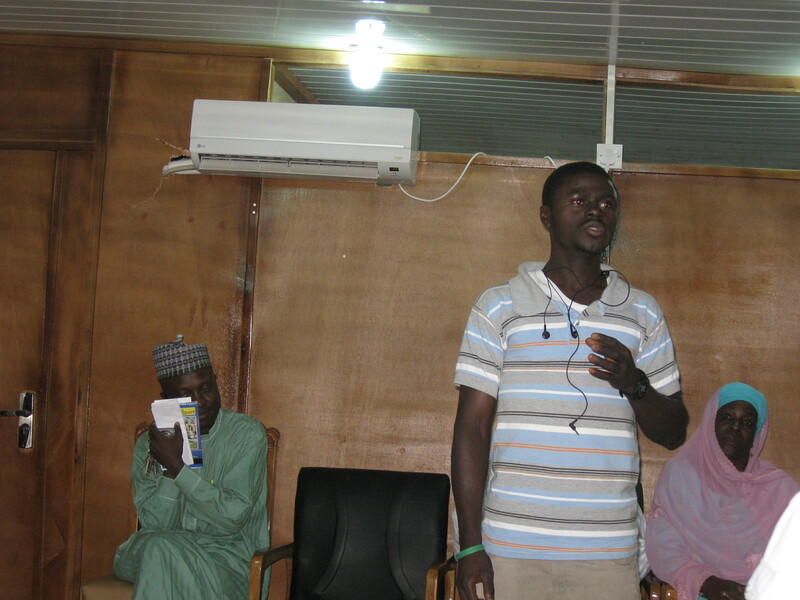 YACPIF asked their Peace Ambassadors, youth working for peace in their communities, what activities they thought that YACPIF could sponsor to further peace. 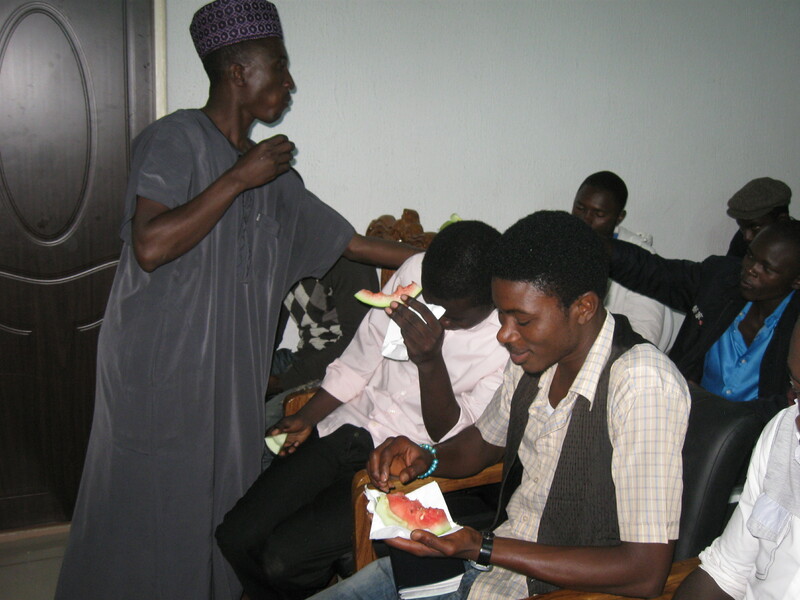 They frequently replied, “Empowerment for the youth.” What type of empowerment, YACPIF asked. 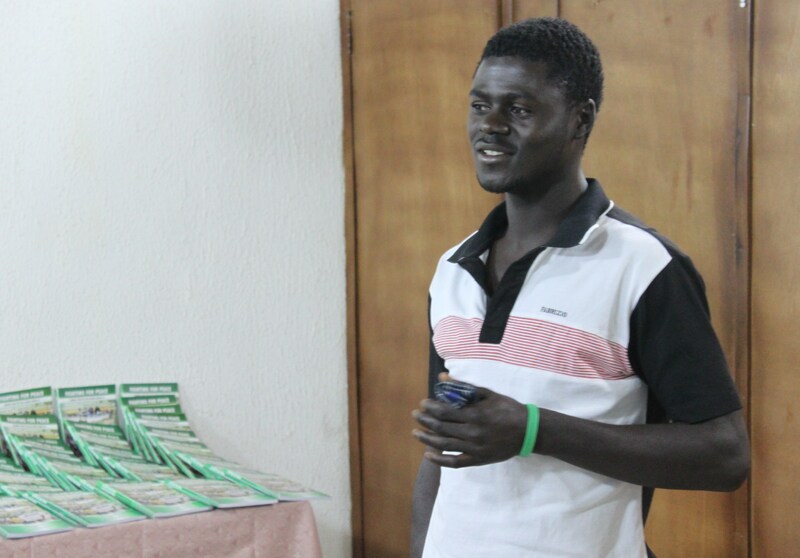 Since the YACPIF office has a small computer lab, the youth suggested computer classes. 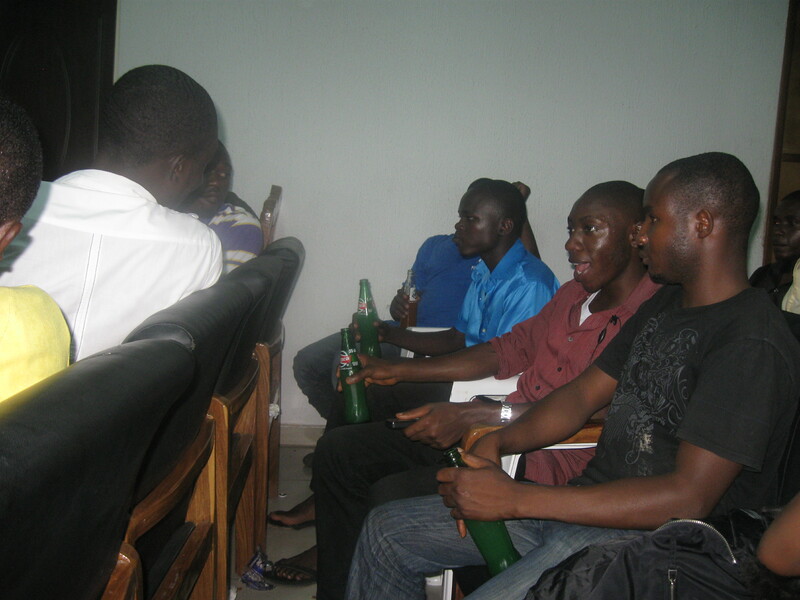 As a result, in October 2011, YACPIF begin having a weekly computer class. Every Wednesday, about 20 youth, equally Christian and Muslim, come together to learn computer skills. 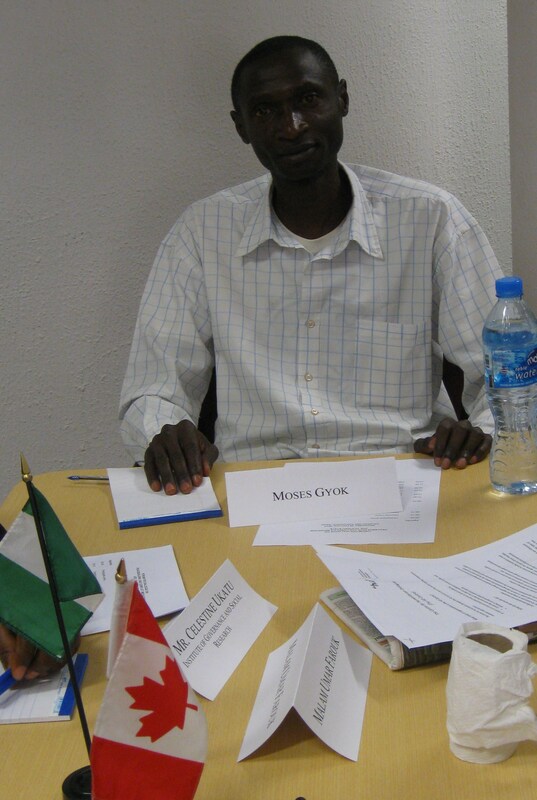 In the process, they also learn peacebuilding skills. Perhaps more than any other activity that YACPIF has sponsored, the computer classes also foster inter-religious friendships. Computer class in the YACPIF computer lab. Reviewing the day's lesson by asking each student a question. 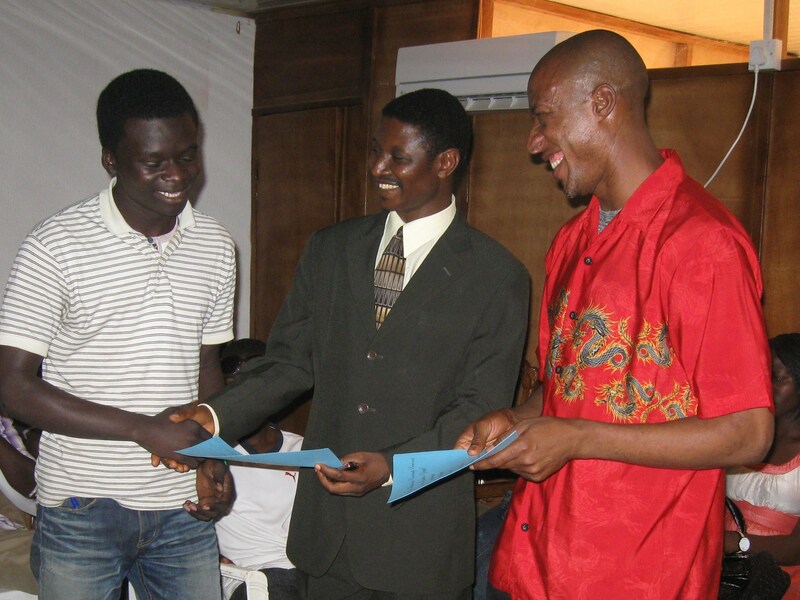 The first YACPIF Computer Class completed their exams, and certificates were awarded during a recent YACPIF Peace Ambassador Assembly. Rev. 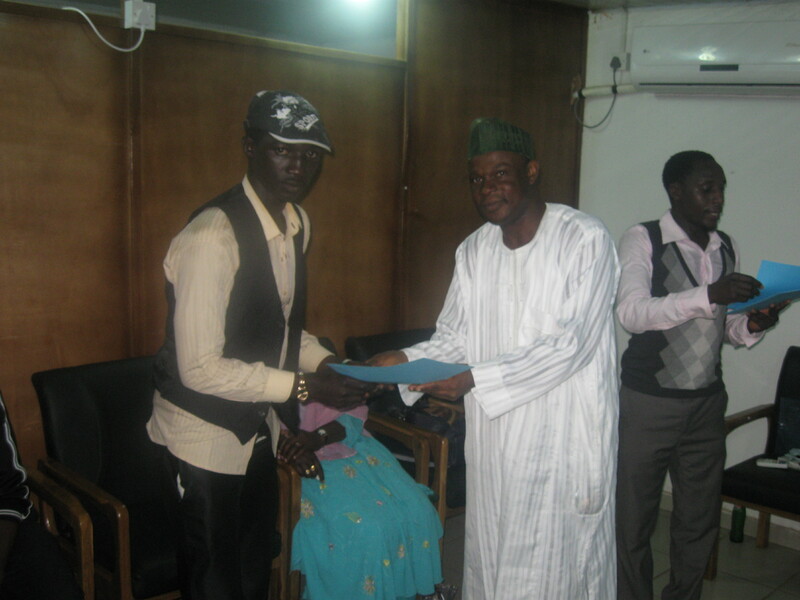 Yakubu Pam, YACPIF Director, and Father, Computer Teacher, awarding a certificate. 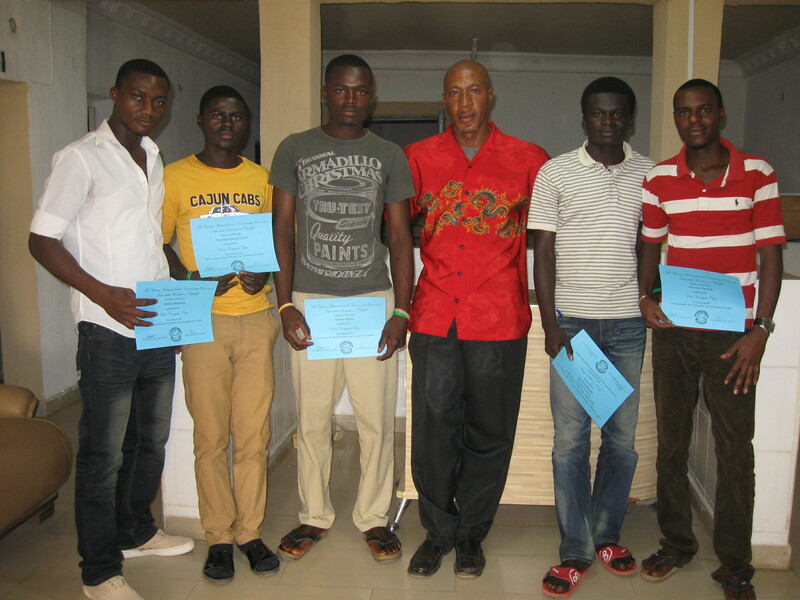 First graduating YACPIF computer class. 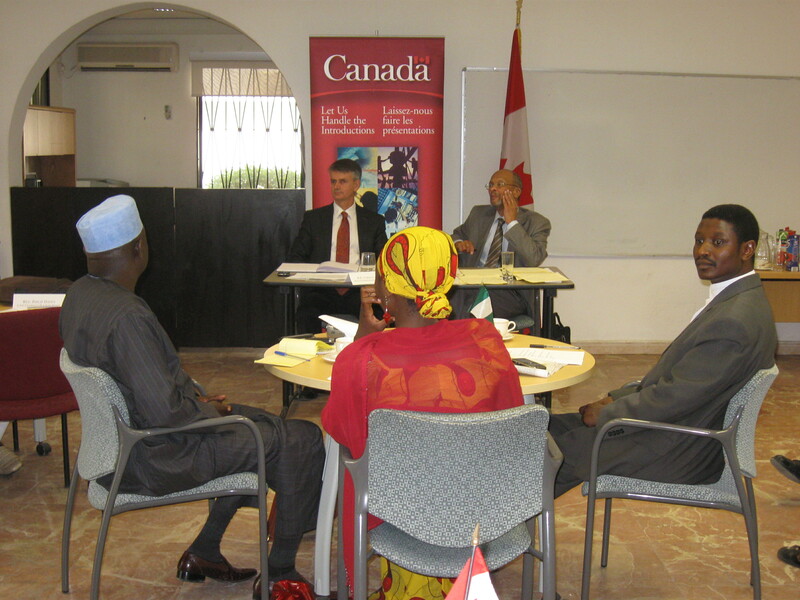 The Canadian High Commission, in cooperation with the Centre for Humanitarian Dialogue and YACPIF, sponsored a Forum for Dialogue on Peacebuilding and Conflict Mediation in Jos, Plateau State on Wednesday, 29 February 2012. 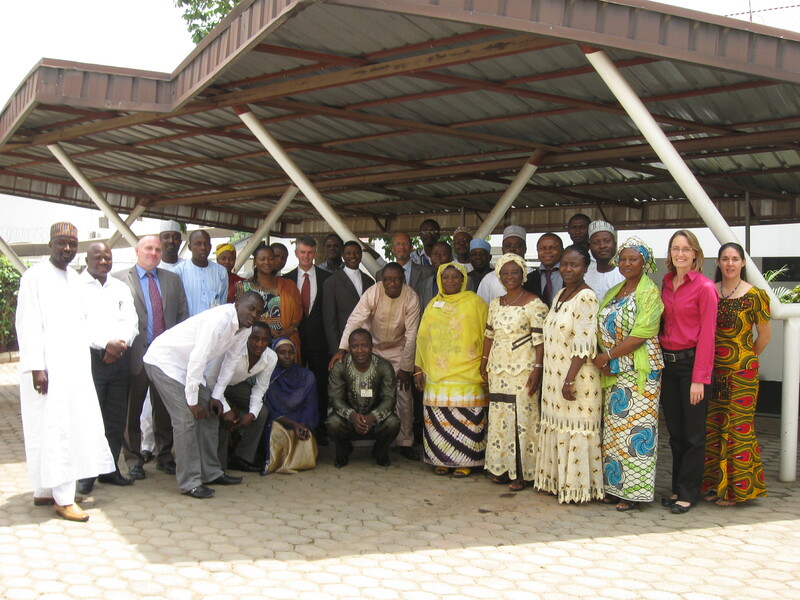 About thirty religious leaders, community leaders, and representatives of NGOs working for peace in Jos gathered to discuss factors contributing to the ongoing crisis in Jos as well as strategies to end the cycle of violence. 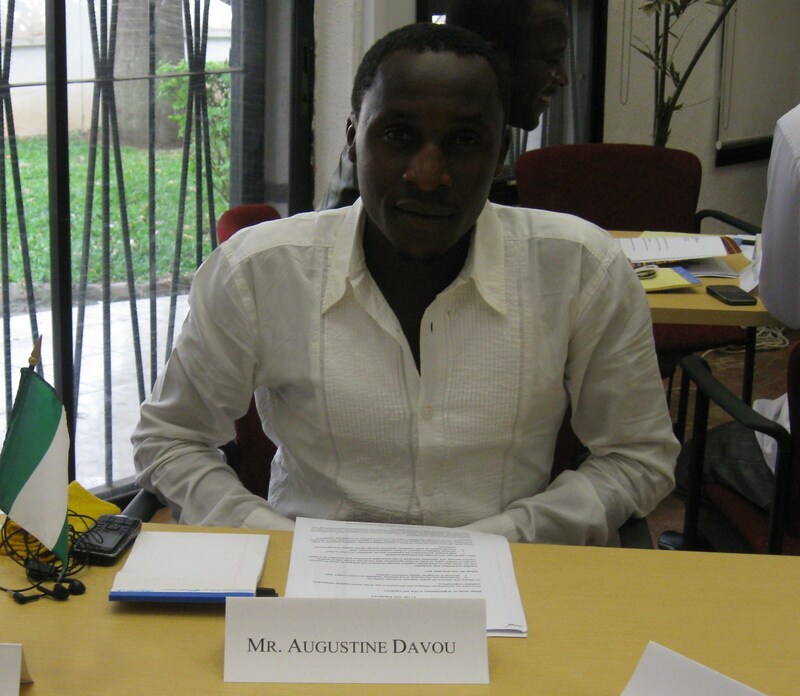 Mr. David Lambo of the Centre for Humanitarian Dialogue also shared his experiences in conflict mediation across the African continent. Canadian High Commissioner and David Lambo at the High Table. 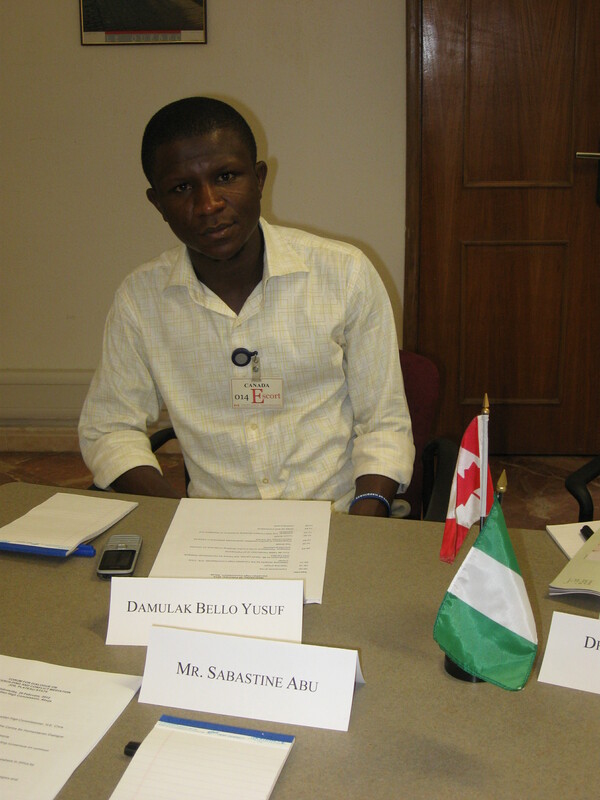 YACPIF was able to send four youth representatives to the program to share their perspectives. 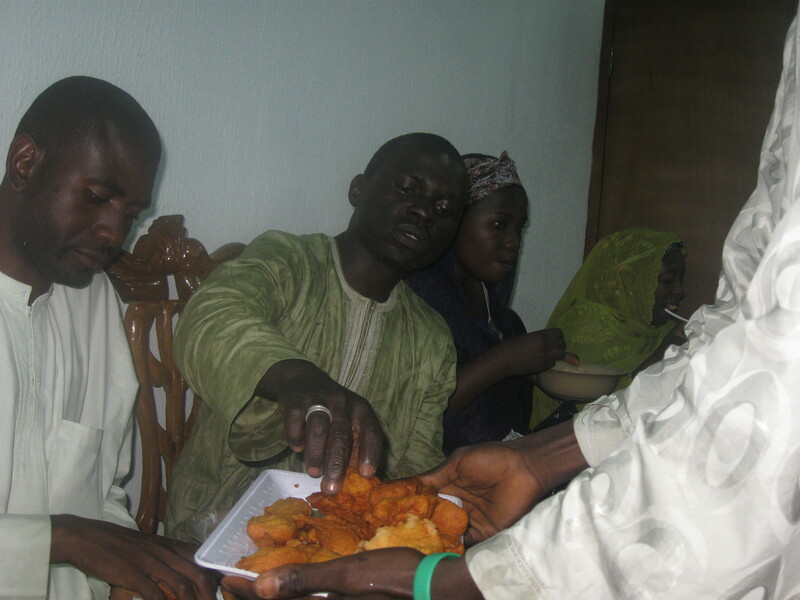 On 13 November, YACPIF held a party to celebrate a peaceful Muslim Sallah holiday. 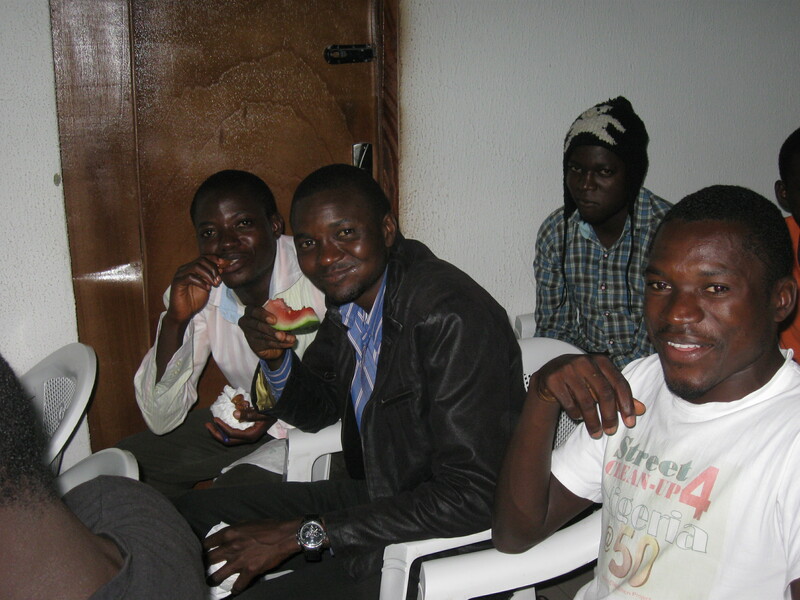 About six weeks later, Christian and Muslim youths gathered again to celebrate a peaceful Christmas holiday. Like at the Sallah celebration, there were prayers for peace and both Christian and Muslim youth discussed the need for peace in Jos. 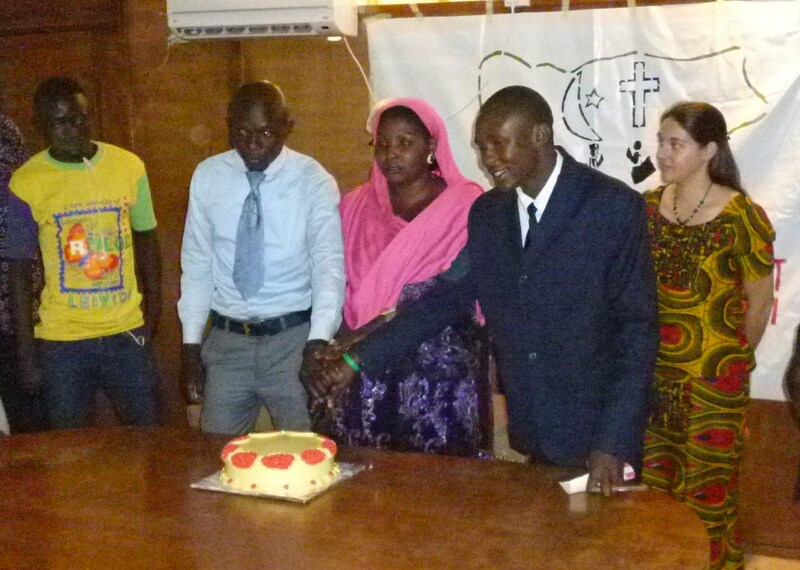 A Christian and Muslim youth cutting the Christmas cake. We are very thankful for all these youth are doing to keep peace in their areas! The most recent round of violence in Jos was on the Eid ul-Fitr Sallah holiday in late August. About six weeks later, Jos was tense, wondering if violence would occur on the Eid al-Adha Sallah holiday. Thankfully, the Eid al-Adha Sallah passed without violence! The day after the Eid al-Adha Sallah, Adams called YACPIF saying that Muslim and Christian youth in his area came together at a big party to celebrate the Sallah. 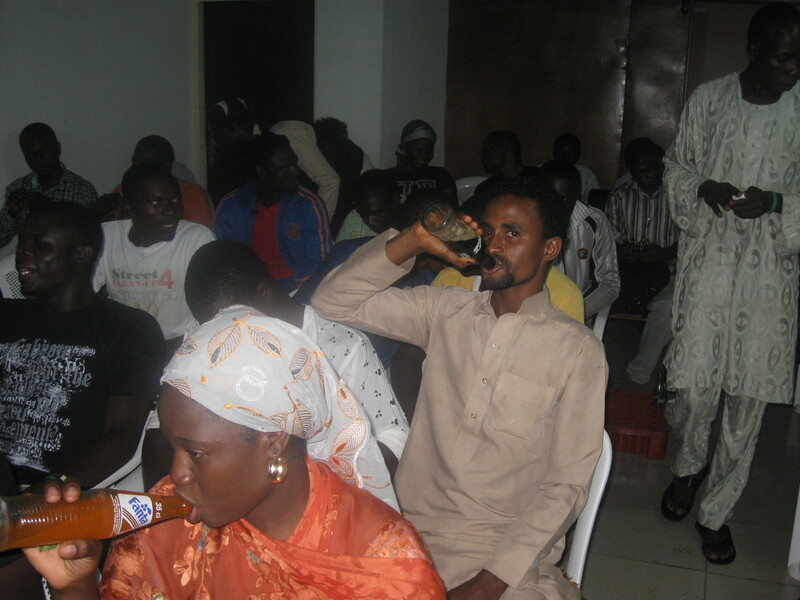 He suggested that YACPIF sponsor a similar Sallah party. 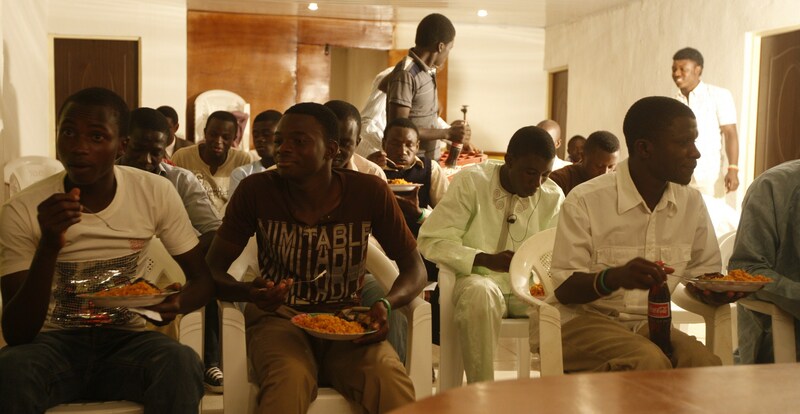 Later that week, three Muslim youth gathered at the YACPIF social center to make plans for the YACPIF Sallah Celebration. 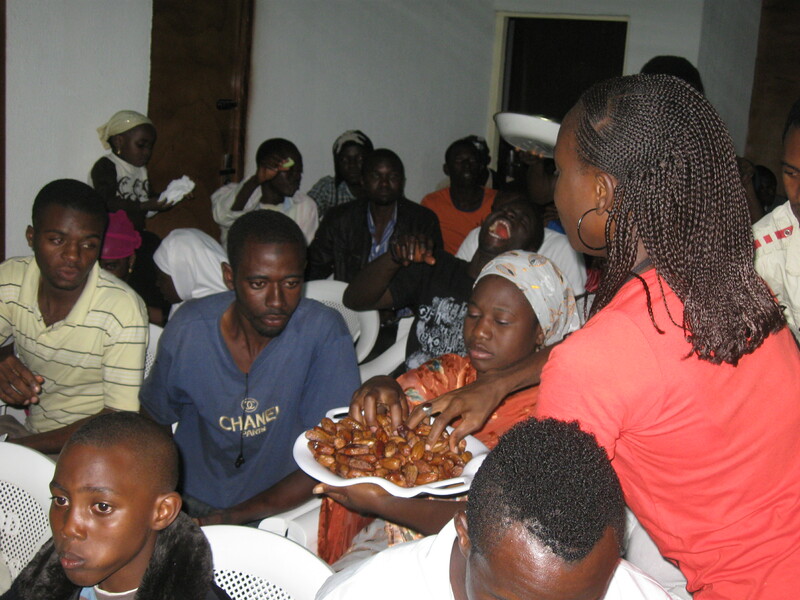 The YACPIF Sallah Celebration held on Sunday, 13 November, one week after the actual Sallah holiday. It was an afternoon filled with fun, friendship, food, and wishes for peace. Dickson was the emcee of the event, and he called on both Muslims and Christians to give speeches about peace. 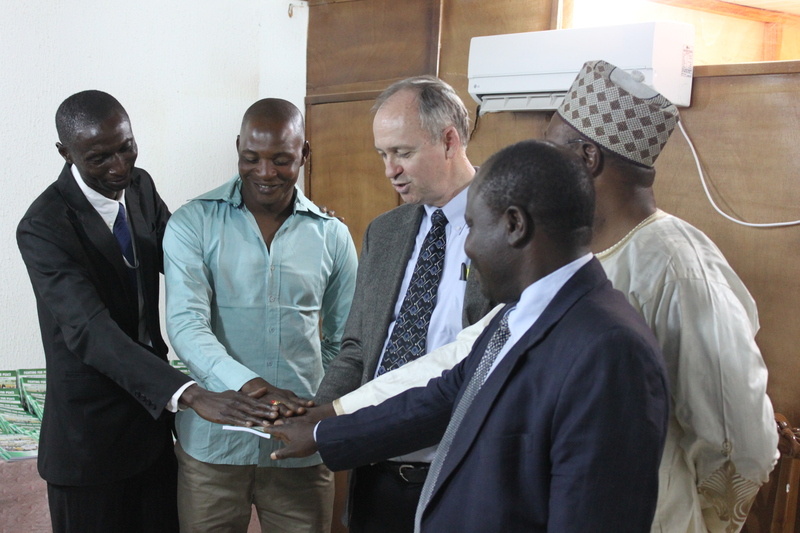 Representatives from both faiths also prayed for peace in Plateau State. Mrs. Pam made a beautiful cake to celebrate the event. The event ended with dancing. 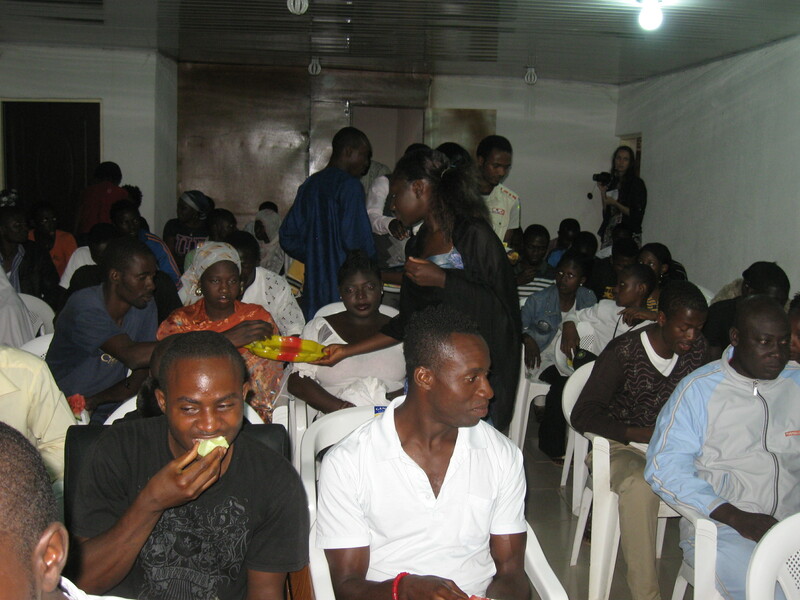 It was a very successful event, and the Christian youth are planning on hosting a similar celebration around Christmas.